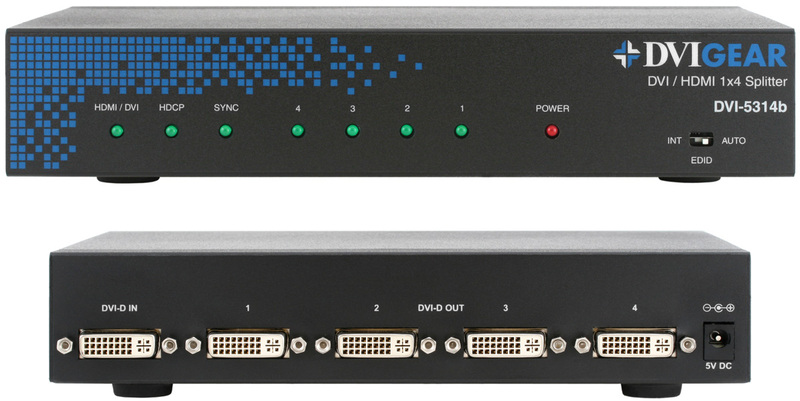 The DVI-5314b is a digital repeater with one (1) DVI and input four (4) independent, re-clocked DVI outputs. All inputs and outputs are fully HDMI v1.3 compatible, which enables full interoperability with both HDMI sources and displays. The unit accepts a single DVI or HDMI input signal, which is de-serialized, buffered and applied to four independent HDMI v1.3 transmitters at each output. The unit supports a full array of DVI and HDMI v1.3 features, which makes it the perfect solution for high-performance DVI and HDMI signal distribution in medium-size display systems.